Marc Marquez had to settle for 2nd on the grid for tomorrow’s race. 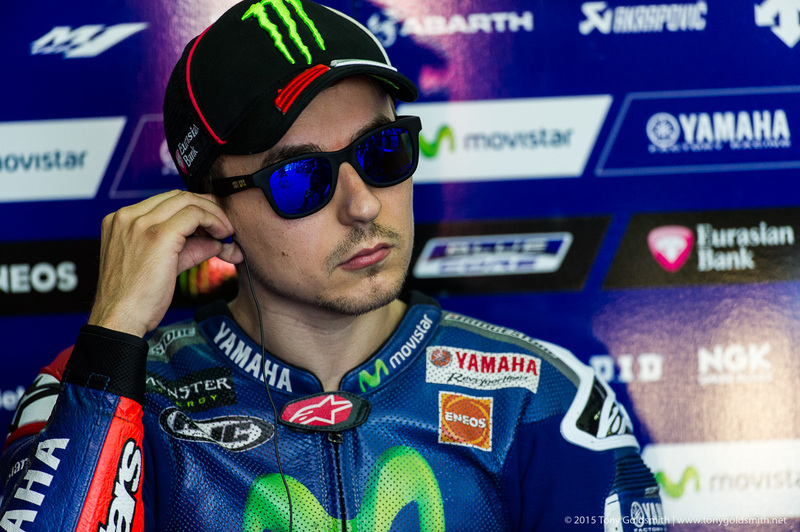 Jorge Lorenzo broke the pole record with a time of 1’30.011 to claim his first pole position at the Valencia Circuit. Dani Pedrosa took the final place on the front row. Jorge Lorenzo and Valentino Rossi head into Silverstone tied on points, with Lorenzo only leading because he has more wins to his name this season than his teammate. With the race that close, who does the season favor? Who will emerge victorious at the end? It is far too early to make any firm predictions, but perhaps we can guess from looking at last year. There are seven races left in 2015, and the seven left this season are the exact same races in the exact same order as the last seven of 2014. That parallel invites comparisons, and the drawing of conclusions, though such conclusions are tenuous at best. However, there are tracks which favor Rossi, and tracks which favor Lorenzo, and their performance there may yet be indicative of the final outcome. After 13 races, 4 continents, 10 countries, 48 flights, 4 ferry journeys, and a train ride. It was time to pack my bag for the last time and take my final four flights of the 2014 MotoGP season. I had been looking forward to the Valencia weekend. Despite it being the final race of the year. I was sharing a house with friends, and it promised to be an enjoyable weekend. Announced during the Phillip Island press conference, Yamaha Racing has decided to release Valentino Rossi from his contractual obligations at the end of the MotoGP season, thus allowing the Italian rider to test with Ducati Corse during the testing sessions at Valencia, which follow immediately after the Valencian GP. While many in the MotoGP paddock expected Yamaha to come to this decision, it’s taken quite some time, and a lot of lobbying and consternation from Rossi to get the Japanese factory to see things his way. Likely wanting to hold onto the Rossi’s star power for as long as possible, and afraid the growing rift between Rossi and Lorenzo could turn into backlash against Yamaha, the Japanese manufacturer has delayed its response to Rossi’s request for as along as seemingly possible. Supposedly honoring it’s gentleman’s agreement with Ducati, Yamaha Racing will have it’s own star-studded cast on-hand for the Valencia test: the newly crowned Rookie of the Year Ben Spies, and FIM MotoGP World Champion Jorge Lorenzo. You may remember Motorland Aragon as the fourth Spanish-based track that was added to the MotoGP schedule after the Hungarian GP was canceled for a second time in two years. Set to play host to MotoGP on September 19th of this year, the Spanish track has also just gotten the nod to host World Superbike with its premiere facilities. However WSBK is taking a different tack from MotoGP, and instead of running two Spanish stops, Motorland Aragon will replace Valencia on the World Superbike calendar for 2011 (and on through 2013).